This book is the first part of a project supported by the Austrian Science Fund, which seeks to produce answers to the basic questions of tort law in Europe from a comparative perspective. 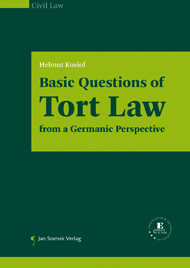 » Basic Questions of Tort Law from a Germanic Perspective « is intended to provide a basis for comprehensive responses by representatives of other European legal families and jurisdictions outside Europe on the fundamental ideas elaborated in this book. The book in hand tries to give a more extensive introduction to the delictual and contractual law of liability and damages. It addresses basic problems and questions and where appropriate elaborates upon them; it queries the usual arguments, prompts the reconsideration of apparently established ideas and enhances awareness of interrelationships. Above all the position of the law of tort within the overall system for the protection of legal goods is examined. The resulting conclusions serve to facilitate the subsequent elaboration of the tasks of the law of tort, in which context the increasingly emphasised economic function is discussed as well as the compensatory, deterrent and penal functions. However, the book is not limited to these very general considerations but also seeks to apply the insights gained in order to examine both general and more specific questions. These in turn aim to provide the reader with information which will enable him or her to understand better the ideas in foreign legal systems. Nonetheless, no attempt is made to provide a complete overview; instead the focus is on particularly controversial issues and new approaches. Not only is the relationship between breaches of obligations and torts examined, the basic requirements for a claim under tort law – damage and causation – are discussed. An extensive section is devoted to the elements of establishing liability; besides wrongfulness and fault, other defects within the sphere of the party liable for damages are looked at: for example, the capacity to bear the economic burden, insurability, the notion of a risk community and the interplay of the various elements. The question of liability on the side of the victim, ie contributory responsibility, is looked at anew – starting from basic principles. After the limitation of liability, the compensation of damage and the reduction of the duty to compensate, a final section is devoted to the prescription of compensation claims.